The lodge is probably the best accommodation in that area. It is located next to a river and it is a nice cosy place. You can walk to a waterfall and by the river from the lodge. We swam at the river during sunset and it was stunning while watching the sunset. Staffs were extremely friendly and helpful and made us feel very welcome. They also have 2 elephants at the lodge and you can get watch the elephants taking bath on the river (where we swam!). I definitely recommend people to stay here. Close to nature and just next to the waterfall! Very beautiful place! We loved our stay and the food. Location is great and staff was super friendly. Only downer was the elephants being chained all day and the elephant bathing. We didn’t know they had this and when we arrived and watched the elephant bathing I got quite upset. The elephant clearly didn’t want to, and the mahout “forced” it I to the water. I am disappointed since it was really not necessary. Otherwise the stay is superbe. Dear Value Customer We appreciate for your kind comments and choosing our service. As our location is nearby the villages and they mostly have the vegetable gardens and plantations, so chaining is the best way to keep our elephants even it's not good for them but it's better than they are being threat and suffering from the villagers after elephants damage or eating their gardens. However we offer our elephants one day off in the week and let them go where ever they want which followed by the mahout. We have to bath our elephants every day even sometime they don't want to, when it's cold (especially in the morning) because this is how to clean and protect them from various of diseases. We hope to seeing you once in near future. Regards, Tadlo Lodge Reservation Manager. Beautyfull setting right at the riverside, nice bungalows but the standard of the rooms is average. You could also say worth half the price, because what you get for your money is simply inadequat: no aircon, no tv, no fridge and the simplest breakfast I had so far. The restaurant yet offers nice dishes and the lovely staff (more or less all people from the near by villages) try to give their best. Again the view is great and thats what you actually pay for. Another "problem" for me was the way of the elefant keeping. They are changed up all day at display for the tourists. The resort is definatley not a sanctuary for them. That could and should be changed by the owners very soon. It is a matter of compassion. Having said this they are treated well by the staff. And since there is no fence and special area for them to be the staff needs to use chains but luckily don't use hooks. It is lovely to see them take a bath in the river together. Booking through Agoda was annoying: the bungalow was overpriced, supposedly the lodge was fully booked, but there were quite a lot of empty Bungalows. Agoda offered an airport Schuttle, of which no one at the Lodge knew about. There is no telephone, so there is no room-service. Fortunately, Mr. Klaus, the interim manager, made a lot of things possible, so that at last we felt very welcome as guests. And: there is a school project in Tad Lo - please train the staff in English Basics! Staff does not speak any English and not helpful or willing to help at all. All very young, not showing any interest in their job. The young girl there gave us higher prices than the real ones when we asked as we came without booking saying there was no room. So we had to book on the internet, and had to wait one hour to check in, calling the owner and Finally Agoda because they were not able to find our booking, and if we had not insisted we would not have had any room at all. We later realised that they had at least two rooms left. When we finally got in the room it was too late to enjoy the surroundings, it was night time, and there was no light in the shower and no hot water. We have been travelling for more than a month already in Tailandia and Laos, sleeping in all sorts of cheap places and had decided to indulge in that place as it looked so lovely, we paid six times the price we had paid until then and we did not even receive half of the service we had had in previous places. At least in the cheap places they speak English. we had booked with breakfast, when we went there at around 09:00, there was nothing left, the staff was having breakfast on a table on the side and they were not replacing food for the guests. One bread left, no milk, no fruit, only eggs. A place like this should have higher standards, especially if they are charging you six times the normal price, and before anything they should have at least one English speaking person onsite. Location is beautiful though. We stayed one night at the Lodge, after taking the tour from Pakse with the motor bike. The location is just great and unique with a lovely view of the Tad Lo waterfall.The bungalow are all next to the river and one can easily swim in the river. They have two elephants at the Lodge. All in all a really nice place unfortunately the staff at the reception ad at the restaurant seems to be very uninteresting. We were the only guests (I saw the list of the rooms) and it took them up to 15 minutes to show up and ask if we needed something event though there were 3-5 girls around. Even if we asked for something, service was really slow. It was very relaxing, great place to chill out and relax watching the elephant's swimming in river, the locals fishing and children playing. We stayed for 5 nights, it is not a place to be if you cannot do without tv, wifi etc. It was great! We had peace and quiet with a nice view over the waterfall. Also took advantage of the elephant ride but I think we have outgrown that kind of activity. It was very cold during the night but that was the only downside to it. A pleasant, clean rural setting on a large property, including waterfalls and water pools for bathing. Elephant rides available. Good Lao food in a pleasant balcony setting. A true corner of paradise, away from the major routes but worth driving to and staying there for many nights to fully appreciate it. The bungalows have windows and balconies offering a great view of the gardens and the Xe Set River, with the eternal soothing sound of the crystal clear water coming from the nearby waterfalls. The lodge has 2 female elephants the can provide a memorable ride along the river and through the forest. Even without riding them, you can attend their amazing bath in the river at the end of the afternoon everyday. Initial impressions on arrival were poor. Booking was not acknowledged by the front desk but confirmed by a quick call. Typical Laos apathy was later replaced by more friendly and attentive service. Relying heavily on it's location, it is probably the best of the bunch in TadLo but don't count on luxury. View of river. That's it. First off, Wifi is NOT available in all rooms. Even though they emailed me and said it was. Pure lie. They DO NOT have wifi anywhere but about 50-100 yards away in the small restaurant. Secondly, the wifi is a 3G card and if more than one person is using it then it is basically worthless. The rooms DO NOT have AC only a fan and mosquito nets which have holes in them. This presents a new problem because of the humidity being by the river. The blankets and towels feel damp and you sleep feeling like the sheets are a bit wet. The bathrooms are adequate but the water pressure is terrible. The food is way overpriced for local Lao food and for what you get. I'm not complaining. We had fun but be forewarned if you desire any of these to be different. If you want to ride the elephants we would recommend you stop by, ride them then leave. There is nothing else that you want here at this lodge. The price of this hotel DOES NOT reflect what you get in return. Isolated location with views to waterfalls and garden setting. Elephants coming down to stream to bathe twice daily. Open airy restaurant. Helpful staff. 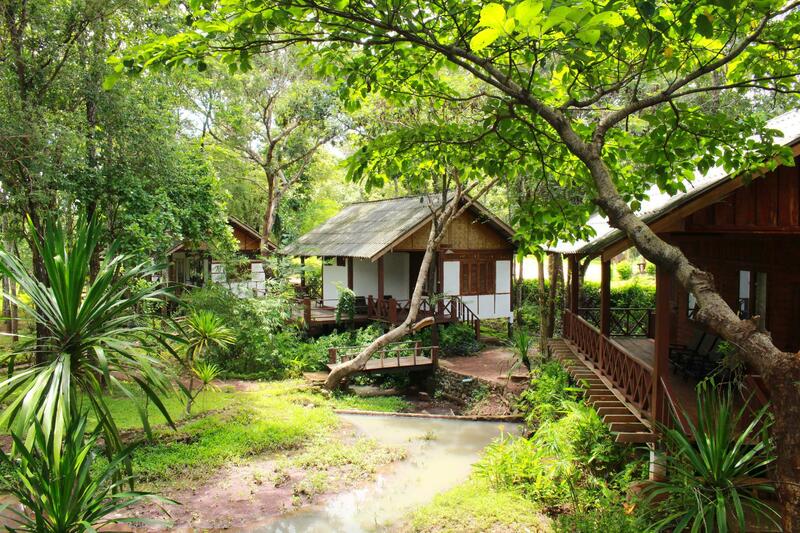 A very peaceful stay in a wonderful tropic environment with waterfalls nearby. Was possible to avail of enjoyable trip to coffee plantations of Bolaven Plateau. 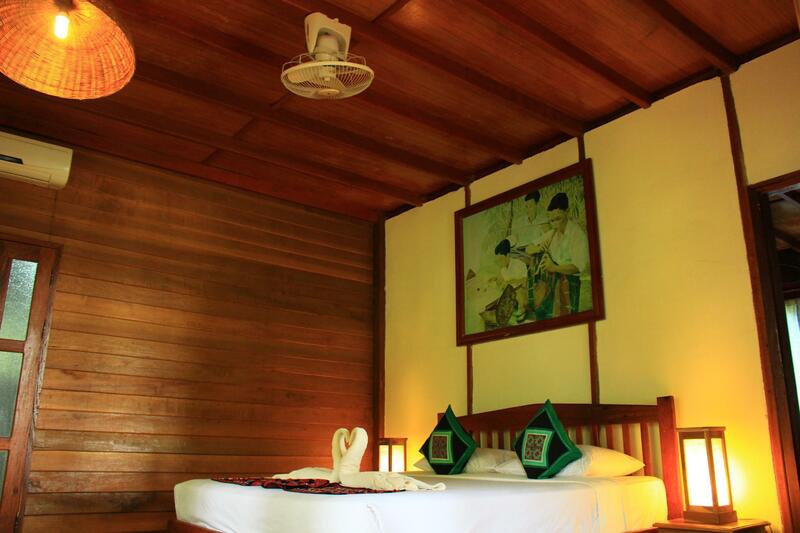 Accommodation in bungalows set in well maintained gardens. On ground elephants with friendly mahouts enhance our stay.